Author(s): Leonardo Ricotti, BioRobotics Institute, Scuola Superiore Sant’Anna, Viale Rinaldo Piaggio, 34, 56025 Pontedera (PI), Italy Andrea Cafarelli, Veronica Iacovacci, Lorenzo Vannozzi, Arianna Menciassi. 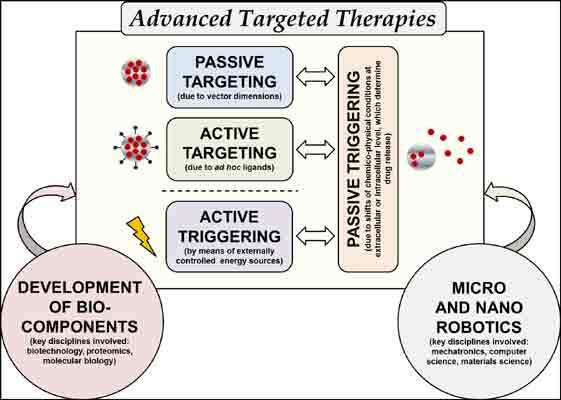 This article aims at highlighting the most recent and promising research trends, the open challenges and the possible routes to follow in the field of targeted therapy. A highly interdisciplinary viewpoint has been used, trying to evidence and discuss the different opportunities deriving from recent evolutions of nanotechnology, polymer science, robotics and biotechnology. The most used vectors for nanomedicine applications are described, together with the different action strategies reported in the literature, such as passive targeting, site-directed targeting and remotely triggerable drug delivery. Special emphasis is given to magnetically triggered systems and ultrasound-responsive materials, identified as the most promising paradigms. Key competences and system integration strategies derived from robotics are also introduced, focusing the attention on the crucial issue of achieving high controllability of the vector at the micro- and nano-scale. Finally, biocomponents are described, highlighting their potential as functional sensing elements or smart mechanisms to be integrated on board of advanced micro-nano therapeutic devices. The conclusion aims at depicting the importance of novel and improved targeted therapy strategies, to be coupled with the emerging world of predicting and personalized medicine. To this aim, a real merging of skills and approaches, derived from the aforementioned research fields, is recognized as highly desirable and rich of opportunities. Keywords: Drug delivery, micro-nano-bio systems, microrobotics, nanocarriers, nanomedicine, nanorobotics, nanotechnology, targeted therapy. Keywords:Drug delivery, micro-nano-bio systems, microrobotics, nanocarriers, nanomedicine, nanorobotics, nanotechnology, targeted therapy. Abstract:This article aims at highlighting the most recent and promising research trends, the open challenges and the possible routes to follow in the field of targeted therapy. A highly interdisciplinary viewpoint has been used, trying to evidence and discuss the different opportunities deriving from recent evolutions of nanotechnology, polymer science, robotics and biotechnology. The most used vectors for nanomedicine applications are described, together with the different action strategies reported in the literature, such as passive targeting, site-directed targeting and remotely triggerable drug delivery. Special emphasis is given to magnetically triggered systems and ultrasound-responsive materials, identified as the most promising paradigms. Key competences and system integration strategies derived from robotics are also introduced, focusing the attention on the crucial issue of achieving high controllability of the vector at the micro- and nano-scale. Finally, biocomponents are described, highlighting their potential as functional sensing elements or smart mechanisms to be integrated on board of advanced micro-nano therapeutic devices. The conclusion aims at depicting the importance of novel and improved targeted therapy strategies, to be coupled with the emerging world of predicting and personalized medicine. To this aim, a real merging of skills and approaches, derived from the aforementioned research fields, is recognized as highly desirable and rich of opportunities.